Please allow time for all the graphics to load. Mitakuye Oyasin... We are all related. Osiyo you honor our lodge with your visit. "Ho! Mitakuye Oyasin"....."We are all related." "Ea Nigada Qusdi Idadadvhni"....."All my relations in creation"
"Donadagohvi"....."Let us see each other again." 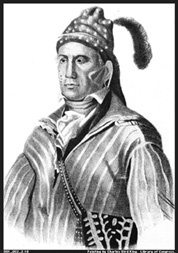 John Adams, American Horse(Joseph Brown Thunder)(Manishne), Aupumut, Babtiste Good, Big Bear, Big Eagle (Wamditanka), Bigfoot, Black Elk, Black Hawk, Black Kettle, Big Thunder, Abel Bosum, William Bowles, Joseph Brant, Canassatego , Choncape, Chou-man-i-case, Cochise, Corn Planter, Crazy Horse/ Tashunke Witko, Commanda, George Copway (Kah-ge-ga-bowh), Dave Chief, Kangi Witka (Crow Feather), Delshay, Deskaheh, Dragging Canoe, Dan George, Dull Knife, Eagle Chief, Eskiminzin , Flat Iron, Fool Crow (Shunka Witko), Gall, Geronimo/Goyathlay, Good Eagle, He-Dog, Hole-in-the-Day - (Bug-o-nay-ki-shig), Ishi, , Joseph, Dan Katchongva , Keokuk, Kicking Bird, Kintpuash, Little Crow-Taoyateduta, Little Raven, Little Pine, Little Turtle, Little Wolf (Ohcumgache), Lone Man (Isna-la-wica), Low-Dog, Luther Standing Bear, Many Horses, Maquinna, Russell Means, Menawa, Montezuma I and II, Molly Occut, Ohiyesa/Dr. 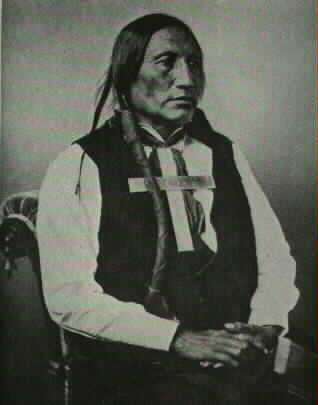 Charles Alexander Eastman, Mougo, Mourning Dove - (Humishuma) (Christine Quintasket), Navajo, Osceola, Ouray, Donehogawa(Ely Parker) Plenty Coups, Pocohantas, Powhatan, Pontiac, Pope, Potelasaro, Quanah Parker, Qwatsinas, Rain-in-the-Face, Red Cloud, Red Jacket (Sogoyewapha), Will Rogers, Roman Nose, John Ross, Sacajawea, Santana,Chief Seattle , Sequoya (George Gist), Shooter Teton, Sitting Bull, Spotted Tail, Squanto (Tisquantum), Standing Bear, Surrounded (Jack), Tonkahaska (Tall Bull), Tamahay, Tecumseh, Mato Noupa (Two Bears), Two Moons, Two Strike/Tashunkekokipapi, Washakie, Wamditanka (Big Eagle), Waubensee, White Eagle, White Horse, Sarah Winnemucca - (Tocmetone),Wolf Robe, Wovoka"
American Horse was a Sioux chief during the Lakota Wars of the 1860s and 1870s. 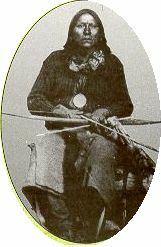 His capture and death was one in a series of defeats for the Sioux after the historic Battle of the Little Bighorn (1876). 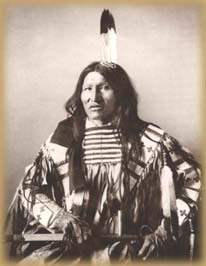 - The white man is in the Black Hills like maggots, and I want you to get them out as quick as you can. The chief of all thieves (General Custer) made a road into the Black Hills last summer, and I want the Great Father to pay the damages for what Custer has done. .If the Indians had tried to make the whites live like them, the whites would have resisted, and it was the same with many Indians. The growing and dying of the moon reminds us of our ignorance which comes and goes- but when the moon is full it is as if the Great Spirit were upon the whole world. "White Buffalo Woman" Sioux Sacred Woman, quoted by Black Elk , (Oglala Sioux)1947. The life of an Indian is like the wings of the air. That is why you notice the hawk knows how to get his prey. The Indian is like that. The hawk swoops down on its prey; so does the Indian. In his lament he is like an animal. For instance, the coyote is sly; so is the Indian. The eagle is the same. That is why the Indian is always feathered up: he is a relative to the wings of the air. I did not know then how much was ended. When I look back now from this high hill of my old age, I can still see the butchered women and children lying heapen and scattered all along the crooked gulch as plain as when I saw them with eyes still young.And I can see that something else died there in the bloody mud, and was buried in the blizzard. A people dream died there. It was a beautiful dream. . . the nations hoop is broken and scattered. There is no center any longer, and the sacred tree is dead. You have noticed that everything as Indian does is in a circle, and that is because the Power of the World always works in circles, and everything tries to be round..... The Sky is round, and I have heard that the earth is round like a ball, and so are all the stars. The wind, in its greatest power, whirls. Birds make their nest in circles, for theirs is the same religion as ours... Even the seasons form a great circle in their changing, and always come back again to where they were. The life of a man is a circle from childhood to childhood, and so it is in everything where power moves. "If I thought that I was doing it myself, the hole would close up and no power could come through. Then everything I could do would be foolish." "How smooth must be the language of the whites, when they can make right look like wrong, and wrong like right." 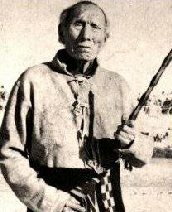 Motavato (Black Kettle) to the Indians at Medicine Creek Lodge - We were once friends with the whites, but you nudged us out of the way by your intrigues, and now when we are in council, you keep nudging (to fight) each other. Why don't you talk and go straight, and let all be well? .Now we are together again to make peace. My shame is as big as the earth, although I will do what my friends have advised me to do. I once thought that I was the only man that persevered to be the friend of the white man, but since they have come and cleaned out our lodges, horses and everything else, it is hard for me to believe the white men any more. "Our wise men are called Fathers, and they truly sustain that character. Do you call yourselves Christians? Does the religion of Him who you call your Savior inspire your spirit, and guide your practices? Surely not. It is recorded of him that a bruised reed he never broke. Cease then to call yourselves Christians, lest you declare to the world your hypocrisy. Cease too to call other nations savage, when you are tenfold more the children of cruelty than they. No person among us desires any other reward for performing a brave and worthwhile action, but the consciousness of having served his nation. I bow to no man for I am considered a prince among my own people. But I will gladly shake your hand." "We know our lands have now become more valuable. The white people think we do not know their value; but we know that the land is everlasting, and the few goods we receive for it are soon worn out and gone." The Wise Man believes profoundly in silence - the sign of a perfect equilibrium. Silence is the absolute poise or balance of body, mind and spirit. The man who preserves his selfhood ever calm and unshaken by the storms of existence - not a leaf, as it were, astire on the tree, not a ripple upon the surface of the shinning pool - his, in the mind of the unlettered sage, is the ideal attitude and conduct of life. Silence is the cornerstone of character. It was our belief that the love of possessions is a weakness to be overcome. Its appeal is to the material part, and if allowed its way, it will in time disturb one's spiritual balance. Therefore, children must early learn the beauty of generosity. They are taught to give what they prize most, that they may taste the happiness of giving. The Indians in their simplicity literally give away all that they have--to relatives, to guests of other tribes or clans, but above all to the poor and the aged, from whom they can hope for no return. 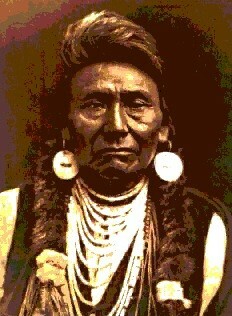 When I was young I walked all over this country, east and west, and saw no other people than the Apaches. After many summers I walked again and found another race of people had come to take it. How is it? Why is it the Apaches wait to die- that they carry their lives on their fingernails? They roam over the hills and the plains and want the heavens to fall on them. The apaches were once a great nation; they are now but few, because of this they want to die and so carry their nails on their fingernails. "You must speak straight so that your words may go as sunlight into our hearts. Speak Americans.. I will not lie to you; do not lie to me." "Traditional people of Indian nations have interpreted the two roads that face the light-skinned race as the road to technology and the road to spirituality. We feel that the road to technology.... has led modern society to a damaged and seared earth. Could it be that the road to technology represents a rush to destruction, and that the road to spirituality represents the slower path that the traditional native people have traveled and are now seeking again? The earth is not scorched on this trail. The grass is still growing there." Among the Indians there have been no written laws. Customs handed down from generation to generation have been the only laws to guide them. Every one might act different from what was considered right did he choose to do so, but such acts would bring upon him the censure of the Nation.... This fear of the Nation's censure acted as a mighty band, binding all in one social, honorable compact. (Tashunka Witco, Tashunca-Uitco, "his horse is crazy"). These are the words of a great Indian hero. Crazy Horse was born in 1844 as an Oglala Sioux. 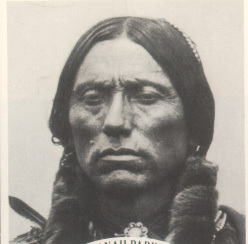 He was the son of an Oglala medicine man of the same name and his Brule wife, the sister of Spotted Tail. 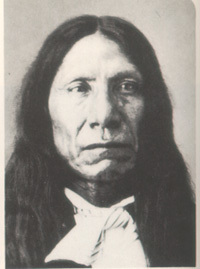 His first name was Curly, after his father, but after his first war-deed at a young age gave him the name Crazy Horse. He had light skin and hair with a very quiet manner. He was not half white as some say, nor was he a captured white boy as others say, many Indians of his tribe were just like him. He also had unusual spiritual powers which others called him "Strange One". 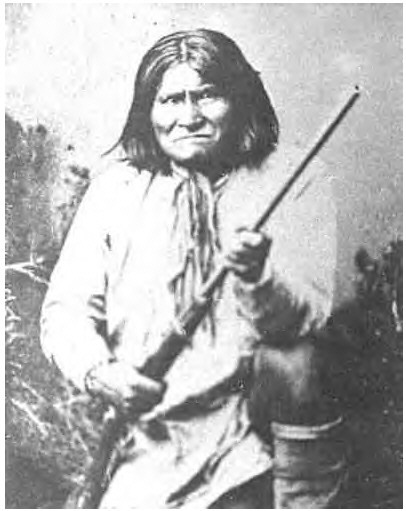 Crazy Horse's real heroism came in 1876, when he led the Sioux to the Battle of the Rosebud and the Little Big Horn. On June 17, they conquered General Crook and his men. Then eight days later along with 2500 other Sioux and Cheyenne at the Little Big Horn. Some say it lasted only ten minutes as Crazy Horse wiped out General Custer and his men. 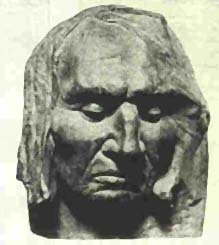 Crazy Horse finally, voluntarily surrendered in 1877 and was killed by a soldier as he was forced into a jail cell on September 5 of that year. "We did not ask you white men to come here. The Great Spirit gave us this country as a home. You had yours. We did not interfere with you. The Great Spirit gave us plenty of land to live on, and buffalo, deer, antelope and other game. But you have come here; you are taking my land from me; you are killing off our game, so it is hard for us to live. Now, you tell us to work for a living, but the Great Spirit did not make us to work, but to live by hunting. You white men can work if you want to. We do not interfere with you, and again you say why do you not become civilized? We do not want your civilization! We would live as our fathers did, and their fathers before them." . . . .
We lived a life of idleness on our reservations. At times we did not get enough to eat and we were not allowed to hunt. "I was hostile to the white man...We preferred hunting. All we wanted was peace and to be let alone. Soldiers came...in the winter..and destroyed our villages. Then Long Hair (Custer) came...They said we massacred him, but he would have done the same to us. Our first impulse was to escape...but we were so hemmed in we had to fight. After that I lived in peace, but the government would not let me alone. I was not allowed to remain quiet. I was tired of fighting...They tried to confine me..and a soldier ran his bayonet into me. I have spoken. "One does not sell the land upon which people walk." .this country is mine, and I was raised in it; my forefathers lived and died in it; and I wish to remain in it. 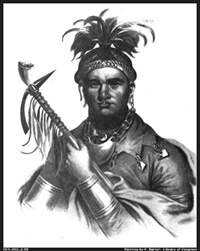 "Whole Indian Nations have melted away like snowballs in the sun before the white man's advance. They leave scarcely a name of our people except those wrongly recorded by their destroyers. Where are the Delewares? They have been reduced to a mere shadow of their former greatness. We had hoped that the white men would not be willing to travel beyond the mountains. Now that hope is gone. They have passed the mountains, and have settled upon Tsalagi (Cherokee) land. They wish to have that usurpation sanctioned by treaty. When that is gained, the same encroaching spirit will lead them upon other land of the Tsalagi (Cherokees). New cessions will be asked. Finally the whole country, which the Tsalagi (Cherokees) and their fathers have so long occupied, will be demanded, and the remnant of the Ani Yvwiya, The Real People, once so great and formidable, will be compelled to seek refuge in some distant wilderness. There they will be permitted to stay only a short while, until they again behold the advancing banners of the same greedy host. Not being able to point out any further retreat for the miserable Tsalagi (Cherokees), the extinction of the whole race will be proclaimed. Should we not therefore run all risks, and incur all consequences, rather than to submit to further loss of our country? Such treaties may be alright for men who are too old to hunt or fight. As for me, I have my young warriors about me. We will hold our land." In the beginning of all things, wisdom and knowledge were with the animals, for Tirawa, the One Above, did not speak directly to man. He sent certain animals to tell men that he showed himself through the beast, and that from them, and from the stars and the sun and moon should man learn.. all things tell of Tirawa. All things in the world are two. In our mind we are two -- good and evil. With our eyes we see two things -- things that are fair and things that are ugly ... We have the right hand that strikes and makes for evil, and the left hand full of kindness, near the heart. One foot may lead us to an evil way, the other foot may lead us to a good. So are all things two, all two. "From Wakan-Tanka, the Great Mystery, comes all power. It is from Wakan-Tanka that the holy man has wisdom and the power to heal and make holy charms. Man knows that all healing plants are given by Wakan-Tanka; therefore they are holy. So too is the buffalo holy, because it is the gift of Wakan-Tanka." Tunkasila, le miyelo. Wotehikeca, le ca mauwelo. Tunkasila, le miyelo. Wotehikca, le ca mauwelo. Tunkasila, le miyelo. Wotehikeca, lena cicu welo. The time will soon be here when my grandchild will long for the cry of a loon, the flash of a salmon, the whisper of spruce needles, or the screech of an eagle. But he will not make friends with any of these creatures and when his heart aches with longing he will curse me. Have I done all to keep the air fresh? Have I cared enough about the water? Have I left the eagle to soar in freedom? Have I done everything I could to earn my grandchild's fondness? Where no one intrudes, many can live in harmony. I shall grab the instruments of the white man's success: His education, his skills, and society. .God made the white man and God made the Apache, and the Apache has just as much right to the country as the white man. I want to make a treaty that will last, so that both can travel over the country and have no trouble. .These Tucson people write for the papers and tell their own story. The Apaches have no one to tell their story. We had no churches, no religious organization, no sabbath days, no holidays, and yet we worshiped. Sometimes the whole tribe would assemble and sing and pray: some times a smaller number, perhaps only two or three. The songs had a few words, but were not formal. The singer would occasionally put in such words as he wished instead of the usual tone sound. Sometimes we prayed in silence; sometimes each prayed aloud; sometimes an aged person prayed for all of us. At other times one would rise and speak to us of our duties to each other and to Usen. Our services were short. "..... sometimes we prayed in silence, sometimes each prayed aloud, sometimes an aged person prayed for all of us. At other times one would rise and speak to us of our duties to each other and to Usen. Our services were short. " Life anew I bring unto ye. Life anew I bring unto ye." The earth was created by the assistance of the sun, and it should be left as it was. . . . The Country was made without lines of demarcation, and it is no mans business to divide it. . . . I see the white all over the country gaining wealth and see their desire to give us lands which are worthless. . . .The earth and my self are of one mind. The measure of land and the measure of our bodies are the same. Say it us if you can say it, that you were sent by Creative Power to talk to us. Perhaps you think the creator sent you here to destroy us as you see fit. If I thought you were sent by the creator I might be I might be induced to think you had a right to dispose of me. Do not misunderstand me, but understand me fully with reference to my affection to the land. I never said the land was mine do do with as I chose. The one who has a right to dispose of it is the one who has created it. I claim a right to live on my land, and accord you the privilage to live on yours. The earth is our mother. She should not be disturbed by hoe or plough. We want only to subsist on what she freely gives us. Our fathers gave us many laws, which they had learned from their fathers. These laws were good. I have carried a heavy load on my back ever since I was a boy. I realized then that we could not hold our own with the white men. We were like deer. They were like grizzly bears. We had small country. Their country was large. We were contented to let things remain as the Great Spirit Chief made them. They were not, and would change the rivers and mountains if they did not suit them. "We are taught to believe that the Great Spirit sees and hears everything, and that he never forgets: that hereafter he will give every man a spirit-home according to his deserts.... This I believe, and all my people belive the same." With a prayer in my mouth I dashed unarmed through a line of soldiers my clothes were cut to piece my horse was wounded but I was not hurt, as I reached the door of my lodge my wife handed me my rifle saying "here's your gun...fight"
I have carried a heavy load on my back ever since I was a boy. I realized then that we could not hold our own with the white men. We were like deer. They were like grizzly bears. We had small country. Their country was large. We were contented to let things remain as the Great Spirit Chief made them. They were not, and would change the rivers and mountains if they did not suit them. I am tired of fighting, our chiefs are all killed, the old men are all dead, the little children are freezing to death. I want to have time to look for my children see how many of them I can find, maybe I shall find them amoung the dead. Hear me my chiefs, I am tired my heart is sick 'nd sad from where the sun now stands, I will fight no more forever. Suppose a white man should come to me and say, Joseph, I like your horses. I want to buy them. I say to him, No, my horses suit me; I will not sell them. Then he goes to my neighbor and says, Pay me money, and I will sell you Joseph's horses. The white man returns to me and says, Joseph, I have bought your horses and you must let me have them. If we sold our lands to the government, this is the way they bought them. 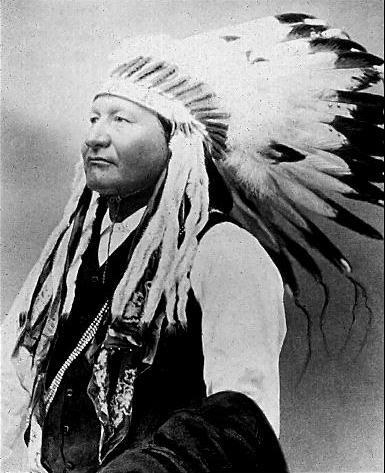 Chief Joseph of the Nez Perce- "In-mut-too-yah-lat-lat" (Thunder coming up over the land from the water)"
When I am dead, cry for me a little. Think of me sometimes, but not too much. It is not good for you or your wife or your husband or your children to allow your thoughts to dwell too long on the dead. Think of me now and again as I was in life, at some moment which is pleasant to recall, but not for long. Leave me in peace as I shall leave you, too, in peace. While you live, let your thoughts be with the living. - I am but one man. I am the voice of my people. Whatever their hearts are, that I talk. I want no more war. I want to be a man. You deny me the right of a white man. My skin is red; my heart is a white man's heart; but I am a Modoc. I am not afraid to die. I will not fall on the rocks. When I die, my enemies will be under me. Your soldiers began (fighting) me when I was asleep on Lost River. They drove us on these rocks like a wounded deer. I have always told the white man heretofore to come and settle in my country; that it was his country and Captain Jack's country. That they could come and live there with me and that I was not mad with them. I never received anything from anybody, only what I bought and paid for myself. I have always lived like a white man, and wanted to live so. I have always tried to live peaceably and never asked any man for anything. I have always lived on what I could kill and shoot with my gun, and catch in my trap. "My father, you have made promises to me and to my children. If the promises had been made by a person of no standing, I should not be surprised to see his promises fail. But you, who are so great in riches and power; I am astonished that I do not see your promises fulfilled! "I would have been better pleased if you had never made such promises than that you should have made them and not performed them. . ."
.They gave up their guns, and the whites killed them all. We cannot all sit on the same side of the Fire. A Council Fire forms a circle, not a line or a square. When we move to the side, we still sit at the Fire with our Brothers and Sisters, but as we move away from one we move toward another. The circle, like the Dream Hoop, brings us ever back to where we start. Any time words of respect and love are spoken, they will return as given. A harsh word runs forever in the circle, eventually vanishing from the wear against itself. Love settles within the Circle, embracing it and thereby lasting forever, turning within itself. The Medicine Wheel is the circle of life (sometimes referred to as the Scared Hoop) Starting with birth and continuing through out our lifes until death, when we have gone full circle. The Medicine wheel has four Direction, each direction offering it's own lessons, color, and animal guide. There are to paths shown which cross in the center, at which point for me is the heart. (for when you work from your heart, you can reach all directions.) The path from East to West is the path of spirits, (the Blue Road) the path from South to North is our physical Walk (the Red Road ). "The American Indian is of the soil, whether it be the region of the forests, plains, pueblos, or mesas. He fits into the landscape, for the hand that fashioned the continent also fashioned the man for his surroundings. He once grew as naturally as the wild sunflowers, he belongs just as the buffalo belonged..."
"Out of the Indian approach to life there comes a great freedom - an intense and absorbing love for nature; a respect for life; enriching faith in a Supreme Power; and principles of truth, honesty, generosity, equity, and brotherhood as a guide to mundane relations." Praise, flattery, exaggerated manners and find high-sounding words were not part of Lakota politeness. Excessive manners were put down as insincere, and the constant talker was considered rude and thoughtless. Conversation was never begun at once, or in a hurried manner. No one was quick with a question, no matter how important, and no one was pressed for an answer. A pause giving time for thought was the truly courteous way of beginning and conducting a conversation. "There is a road in the hearts of all of us, hidden and seldom traveled, which leads to an unkown, secret place. The old people came literally to love the soil, and they sat or reclined on the ground with a feeling of being close to a mothering power. Their teepees were built upon the earth and their alters were made of earth. The soul was soothing, strengthening, cleasnsing and healing. 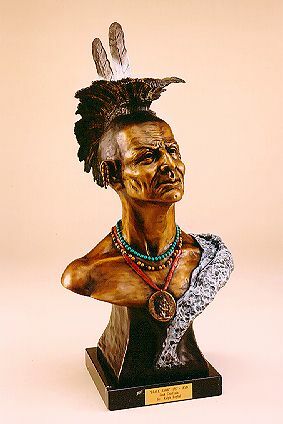 That is why the old Indian still sits upon the earth instead of propping himself up and away from its life giving forces. For him, to sit or lie upon the ground is to be able to think more deeply and to feel more keenly. He can see more clearly into the mysteries of life and come closer in kinship to other lives about him." 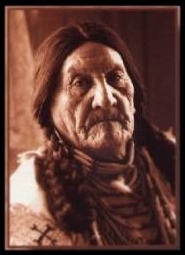 The old Lakota was wise. He knew that a mans heart away from nature becomes hard. "Knowledge was inherent in all things. The world was a library and its books were the stones, leaves, grass, brooks and the birds and animals that shared, alike with us, the storms and blessings of the earth. We learn to do what only the student of nature ever learns, and that is to feel beauty. We never rail at the storms, the furious winds, the biting frosts and snows. To do so intensifies human futility, so whatever comes we should adjust ourselves by more effort and energy if necessary, but without complaint. Bright days and dark days are both expressions of the Great Mystery, and the Indian reveled in being close the the Great Holiness." As a child I understood how to give, I have forgotten this grace since I have become civilized. Out of the Indian approach to life there came a great freedom -- an intense and absorbing love for nature; a respect for life; enriching faith in a Supreme Power; and principles of truth, honesty, generosity, equity, and brotherhood as a guide to mundane relations. We heard of guns and powder and lead - first flintlocks, then percussion caps, and now repeating rifles. We first saw the Americans at Cottonwood Wash. We had wars with the Mexicans and the Pueblos. We captured mules from the Mexicans, and had many mules. The Americans came to trade with us. When the Americans first came we had a big dance, and they danced with our women. We also traded. "I will follow the white man's trail. I will make him my friend, but I will not bend my back to his burdens. I will be cunning as a coyote. I will ask him to help me understand his ways, then I will prepare the way for my children, and their children. 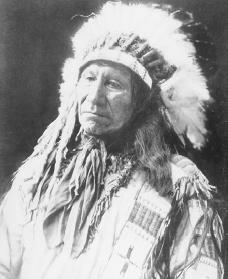 The Great Spirit has shown me - a day will come when they will outrun the white man in his own shoes." Menawa - Hothlepoya, Upper Towns Creek. 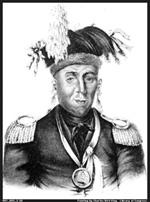 (1780s-???) "Crazy War Hunter"
rries and dug her first roots, they were given away to an elder so she would share her future success. When a child carried water for the home, an elder would give compliments, pretending to taste meat in water carried by a boy or berries in that of a girl. The child was encouraged not to be lazy and to grow straight like a sapling. I told the officer that this was very bad business; that it was very bad for the commissioner to give such an order. I said it was very bad; that we ought not fight, because we were brothers, and the officer said that didnt make any difference; that Americans would fight even though they were born of the same mother. - The Army can destroy the Sioux. You can order them around. But we Utes have never disturbed you whites. So you must wait until we come to your way of doing things. I see no longer the curling smoke rising. I hear no longer the songs of women. Only the wail of the coyote is heard. The Pocahontas Myth Pocahontas Do you know the true story of Rebecca Rolfe (also known as Pocahontas)? "The Tonkawa killed him - it make my heart hot. I want my people follow after white way. Some white people do that, too." Whose voice was first sounded on this land? The voice of the red people who had but bows and arrows . . . What has been done in my country I did not want, did not ask for it; white people going through my country. . . . When the white man comes in my country he leaves a trail of blood behind him. . . I have two mountains in that country- The Black Hills and the Big Horn Mountain. I want the great father to make no roads through them. I have told these things three times; now I have come here to tell them the fourth time. ... I hope the Great Heavenly Father, who will look down upon us, will give all the tribes his blessing, that we may go forth in peace, and live in peace all our days, and that He will look down upon our children and finally lift us far above this earth: and that our Heavenly Father will look upon our children as His children, that all the tribes may be His children, and as we shake hands to-day upon this broad plain, we may forever live in peace. "I am poor and naked, but I am the chief of a nation. We do not want riches but we do want to train our children right. Riches would do us no good. We could not take them with us to the other world. We do not want riches. We want peace and love." They made us many promises, more than I can remember, but they never kept but one; they promised to take out land, and the did. "- The Great Spirit raised both the white man and the Indian. I think he raised the Indian first. He raised me in this land, it belongs to me. The white man was raised over the great waters, and his land is over there. Since they crossed the sea, I have given them room. There are now white people all about me. I have but a small spot of land left. The Great Spirit told me to keep it." "In 1868, men came out and brought papers. We could not read them and they did not tell us truly what was in them. We thought the treaty was to remove the forts and for us to cease from fighting. But they wanted to send us traders on the Missouri, but we wanted traders where we were. When I reached Washington, the Great Father explained to me that the interpreters had deceived me. All I want is right and just." - There was no hope on earth, and God seemed to have forgotten us. Some said they saw the Son of God; others did not see him. If He had come, He would do some great things as He had done before. We doubted it because we had seen neither Him nor His works. The people did not know; they did not care. They snatched at the hope. They screamed like crazy men to Him for mercy. They caught at the promise they heard He had made. The white men were frightened and called for soldiers. We had begged for life, and the white men thought we wanted theirs. We heard that the soldiers were coming. We did not fear. We hoped that we could tell them our troubles and get help. A white man saifd the soldiers meant to kill us. We did not believe it, but some were frightened and ran away to the Badlands. "We first knew you a feeble plant which wanted a little earth whereon to grow. We gave it to you; and afterward, when we could have trod you under our feet, we watered and protected you; and now you have grown to be a mighty tree, whose top reaches the clouds, and whose branches overspread the whole land, whilst we, who were the tall pines of the forest, have become a feeble plant and need your protection." Woquini (Roman Nose) to General Winfield Scott Hancock - Are not women and children more timid than men? The Cheyenne warriors are not afraid, but have you never heard of Sand Creek? Your soldiers look just like the soldiers that butchered women and children there. "I love this land and the buffalo and will not part with it. I want you to understand well what I say. Write it on paper...I hear a great deal of good talk from the gentlemen the Great Father sends us, but they never do what they say. I don't want any of the medicine lodges (schools and churches) within the country. I want the children raised as I was. I have heard you intend to settle us on a reservation near the mountains. I don't want to settle. I love to roam over the prairies. There I feel free and happy, but when we settle down we grow pale and die. A long time ago this land belonged to our fathers, but when I go up to the river I see camps of soldiers on its banks. These soldiers cut down my timber, they kill my buffalo and when I see that, my heart feels likebursting." "Every part of the earth is sacred to my people. Every shining pine needle, every sandy shore, every mist in the dark woods, every meadow, every humming insect. All are holy in the memory and experience of my people.". . . .
"Will you teach your children what we have taught our children? That the earth is our mother? What befalls the earth befalls all the sons of the earth. "This we know: the earth does not belong to man, man belongs to the earth. All things are connected like the blood that unites us all. Man did not weave the web of life, he is merely a strand in it. Whatever he does to the web, he does to himself. "One thing we know: our god is also your god. The earth is precious to him and to harm the earth is to heap contempt on its creator. When the last red man has become a myth among the white men, when your childrens children think them selves alone in the field, upon the highway or in the silence paths of the woods, they will not be alone. In all the earth there is no place dedicated to solitude. At night when the streets ofyour cities are silent, and you think them deserted, they will throng with the returning hosts that once filled them and still love this beautiful land. It matters little where we pass the remnant of our days. They will not be many. The Indian's night promises to be dark. Not a single star of hope hovers above his horizon. Sad-voiced winds moan in the distance. Grim fate seems to be on the Red Man's trail, and wherever he will hear the approaching footsteps of his fell destroyer and prepare stolidly to meet his doom, as does the wounded doe that hears the approaching footsteps of the hunter. A few more moons, a few more winters, and not one of the descendants of the mighty hosts that once moved over this broad land or lived in happy homes, protected by the Great Spirit, will remain to mourn over the graves of a people once more powerful and hopeful than yours. But why should I mourn at the untimely fate of my people? Tribe follows tribe, and nation follows nation, like the waves of the sea. It is the order of nature, and regret is useless. Your time of decay may be distant, but it will surely come, for even the White Man whose God walked and talked with him as friend to friend, cannot be exempt from the common destiny. We may be brothers after all. We will see. Chief Seattle Speech About the Chief Seattle Speech The Alternative "Chief Seattle Statement"
We want no white person or persons here. The Black Hills belong to me. If the whites try to take them, I will fight. 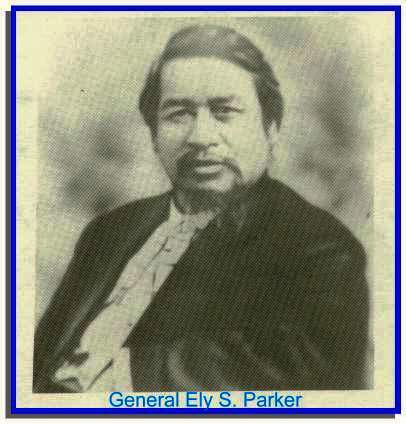 "If the Great Spirit had desired me to be a white man he would have made me so in the first place. He put in your heart certain wishes and plans, and in my heart he put other and different desires. It is not necessary for eagles to be crows." "I am a red man. If the Great Spirit had desired me to be a white man he would have made me so in the first place. He put in your heart certain wishes and plans, in my heart he put other and different desires. Each man is good in his sight. It is not necessary for Eagles to be Crows. We are poor..but we are free. No white man controls our footsteps. If we must die...we die defending our rights." .I feel that my country has gotten a bad name, and I want it to have a good name; it used to have a good name; and I sit sometimes and wonder who it is that has given it a bad name. Behold, my brothers, the spring has come; the earth has received the embraces of the sun and we shall soon see the results of that love! Every seed has awakened and so has all animal life. It is through this mysterious power that we too have our being and we therefore yield to our neighbours, even our animal neighbours, the same right as ourselves, to inhabit this land. Yet hear me, my people, we have now to deal with another race - small and feeble when our fathers first met them, but now great and overbearing. Strangely enough they have a mind to till the soil and the love of possessions is a disease with them . . . They claim this mother of ours, the earth, for their own, and fence their neighbours away; they deface her with their buildings and their refuse. They threaten to take [the land] away from us. My brothers, shall we submit, or shall we say to them: "First kill me before you take possession of my Fatherland." 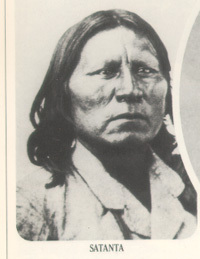 Sitting Bulls Speech at the Powder River Council, 1877. .It has been our wish to live here in our country peacefully, and do such things as may be for the welfare and good of our people, but the Great Father has filled it with soldiers who think only of our death. Some of our people who have gone from here in order that they should have a change, and others who have gone north to hunt, have been attacked by soldiers from this direction, and when they have gone north have been attacked by soldiers from the other side, and now when they are willing to come back the soldiers stand between them in order to keep them from coming home. It seems to me that there is a better way than this, When people come to trouble, it is better for both parties to come together without arms and talk it over and find some peaceable way to settle it. When the prairie is on fire you see animals surrounded by the fire; you see them run and try to hide them selves so that they will not burn. That is the way we are here. .The buffalo are diminishing fast. The antelope, that were plenty a few years ago, they are now thin. When they shall all die, we shall be hungry; we shall want something to eat, and we will be compelled to come into the fort. Your young men must not fire at us; whenever they see us they fire, and we fire on them. .My children have been exterminated; my brother has been killed. "The 'Great Mystery' has decreed that I must be disgraced. There will be no pleasure for me now, and I shall be ridiculed even by my enemies. It will be well for me to enter soon into Paradise, for I shall be happy in spending my youth there. But I will sell my life dearly. Hereafter my name shall be spoken in the traditions of our race." So live your life that the fear of death can never enter your heart. Trouble no one about their religion; respect others in their view, and Demand that they respect yours. Love your life, perfect your life, Beautify all things in your life. Seek to make your life long and Its purpose in the service of your people. Prepare a noble death song for the day when you go over the great divide. Always give a word or a sign of salute when meeting or passing a friend, Even a stranger, when in a lonely place. Show respect to all people and Bow to none. When you arise in the morning, give thanks for the food and For the joy of living. If you see no reason for giving thanks, The fault lies only in yourself. Abuse no one and nothing, For abuse turns the wise ones to fools and robs the spirit of its vision. When it comes your time to die, be not like those whose hearts Are filled with fear of death, so that when their time comes They weep and pray for a little more time to live their lives over again In a different way. Sing your death song and die like a hero going home." "No tribe has the right to sell, even to each other, much less to strangers.... Sell a country! Why not sell the air, the great sea, as well as the earth? Didn't the Great Spirit make them all for the use of his children? The way, the only way to stop this evil is for the red man to unite in claiming a common and equal right in the land, as it was first, and should be now, for it was never divided." We gave them forest-clad mountains and valleys full of game, and in return what did they give our warriors and our women? Rum, trinkets, and a grave. Brothers -- My people wish for peace; the red men all wish for peace; but where the white people are, there is no peace for them, except it be on the bosom of our mother. Where today are the Pequot? Where today are the Narrangansett, the Mohican, the Pakanoket, and many other once powerful tribes of our people? They have vanished before the avarice and the oppression of the White Man, as snow befor a summer sun." - The Great Father's young men are going to carry gold away from the hills. I expect they will fill a number of houses with it. In consideration for this, I want my people to be provided for as long as they live. "The white man, who possesses this whole vast country from sea to sea, who roams over it at pleasure and lives where he likes, cannot know the cramp we feel in this little spot, with the underlying remembrance of the fact, which you know as well as we, that every foot of what you proudly call America not very long ago belonged to the red man. The Great Spirit gave it to us. There was room for all His many tribes, and all were happy in their freedom." "Grandfather, Great Spirit, once more behold me on earth and lean to hear my feeble voice. You lived first, and you are older than all need, older than all prayer. All things belong to you -- the two-legged, the four-legged, the wings of the air, and all green things that live. Oh, Great Spirit, in my dream I heard the thunder of buffalo and saw a great cloud of dust rise in the East and cover the sun. I heard a bull call my name - White Bear, come dance with me. As we danced I looked into his angry eye and saw the empty cooking pots of my people. Today I meet the buffalo once again in the dance of death. I ask you to make my chest as strong as a hundred buffalo. Make my heart as brave as the bear who lent me his name. Bless this lance with your magic. May it find the heart of the buffalo and be greeted like a lover returned from a long journey. White Bears song rises like an arrow through the trees searching out the ear of the Great Spirit. Soon the age-old dance of life and death will begin on the prairie. The plains will resound with the war whoops of Indian braves and the angry bellows of charging buffalo. But now, amid the peace of this sacred place, the Sioux warrior lifts his voice and his arms to heaven, and feels his soul lighten and his prayer answered. - The Soldiers came to the borders of the village and forced us across the Niobrara to the other side, just as one would drive a herd of ponies; and the soldiers pushed us until we came to the Platte River. They drove us on in advance just as if we were a herd of ponies, and I said, "If I have to go, I'll go to that land. Let the soldiers go away, our women are afraid of them." And so I reached the Warm Land (Indian Territory). We found the land there was bad and we were dying one after another, and we said, "What man will take pity on us?" And our animals died. Oh, it was very hot. "This land is truly sickly, and we'll be apt to die here, and we hope the Great Father will take us back again." That is what we said. There were one hundred of us died there. "Sarah was born into a family of great leaders with both her father and her grandfather having been Chiefs of this Nevada Nation"
- I never want to leave this country; all my relatives are lying here in the ground. And when I fall to pieces I am going to fall to pieces here. "You ask me to plow the ground. Shall I take a knife and tear my mother's bosom? Then when I die she will not take me to her bosom to rest. "You ask me to dig for stones! Shall I dig under her skin for bones? Then when I die I cannot enter her body to be born again. "You ask me to cut grass and make hay and sell it and be rich like white men, but how dare I cut my mother's hair? "I want my people to stay with me here. All the dead men will come to life again. Their spirits will come to their bodies again. We must wait here in the homes of our fathers and be ready to meet them in the bosom of our mother." Grandfather says that when your friends die you must not cry. You must not hurt anybody or do harm to anyone. You must not fight. Do right always. It will give you satisfaction in life. When the sun died, I went up to heaven and saw God and all the people who had died a long time ago. God told me to come back and tell my people they must be good and love one another, and not fight, or steal, or lie. He gave me this dance to give to my people. - All Indians must dance, everywhere, keep on dancing. Pretty soon in the next spring Great Spirit come. He bring back all game of every kind. The game will be thick everywhere. All dead Indians come back and live again. They all be strong just like young men, be young again. Old blind Indians see again and get young and have fine time. 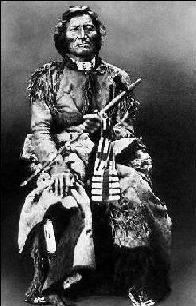 When Great Spirit comes this way, then all the Indians go to the mountains, high up away from the whites. Whites cant hurt Indians then. Then while Indians way up high, big flood comes like water and all white people die, get drowned. After that, water go away and then nobody but Indians everywhere and game all kinds thick. Then medicine man tell Indians to send word to all Indians to keep up dancing and the good time will come. Indians who don't dance, who don't believe in the word, will grow little, just about a foot high, and stay that way. Some of them will be turned into wood and be burned in fire. Wovoka - The Visionary Wovoka (Jack Wilson Wovoka - Prophet or Daemon? The white man says, there is freedom and justice for all. We have had "freedom and justice," and that is why we have been almost exterminated. We shall not forget this." The Third Time You Stand Alone"
"THE MAROONED PRIEST WHO SPEEDED THE CONQUEST (1489? - 1531?)" 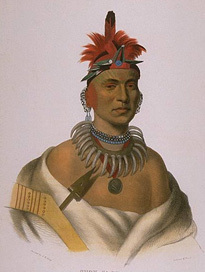 "Aspinet was the chief sachem of the Nauset Indians"
"He was a Natchez leader who brought his people to Talladega in 1756"
"The hero of Glorietta Pass and the butcher of Sand Creek"
LAST OF THE GREAT SCOUTS: THE LIFE STORY OF COL. WILLIAM F. CODY "BUFFALO BILL"
"Conanacus was the chief sachem of the Narragansetts"
"Corbitant was a petty-sachem under chief Massasoit of the Wampanoags"
"Coronado led a royal expedition of about 300 Spanish soldiers, over 1,000 Tlaxcalan Indians, and enormous herds of livestock north into what is now the American West"
"the ironic situation of a man who changed history, being a virtual unknown in a country on which he exerted such a profound influence. " 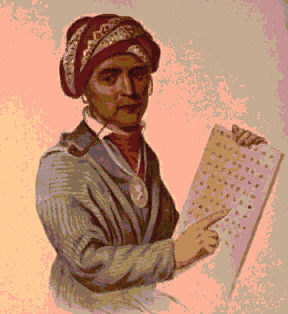 "Considered the army's greatest Indian fighter, General George Crook earned that reputation by developing a respect for his enemy that carried over into his relationships with Native Americans off the battlefield as well"
"last emperor of the Aztecs"
"daughter of a Chippewa Indian mother and a German-American father, the author explores Native American themes in her works"
"tales of the adventures that befell three conquistadores and their Moorish slave during the sixteenth century led to Spain's Francisco Vásquez de Coronado's exploration of what is now the American Southwest." "A Monster So Brutal: Simon Girty"
"the Degenerative Myth of the American Frontier, 1783-1900"
"Welcome to our page devoted to appreciation of a remarkable Canadian Actor"
"Grey Owl wrote three best-selling books while he lived in Prince Albert National Park: Pilgrims of the Wild (1935), Sajo and Her Beaver People (1935) and Tales of an Empty Cabin (1936)"
detailed account of the "Father of the Mestizos of Yucatan"
short article on this "Catawba Indian Chief"
"This famous Miccosukee chief was of the Wind Clan"
"Iyanough was the chief sachem of the the Cummaquid tribe"
"President Andrew Jackson's Case for the Removal Act First Annual Message to Congress, 8 December 1830"
from "200 YEARS AGO ON THE S. GEORGIA FRONTIER"
a letter from "J. Ross Browne to Commissioner of Indian Affairs, 4 December 1857"
"former Principal Chief of the Cherokee Nation"
"Chief of the Mississippi Band of Choctaw Indians"
"Massasoit was the Chief of the Wampanoag confederation"
about "Tustunnugee Hutkee (White Warrior)"
"The Last of the Androscoggins, The Lone Indian of the Magalloway"
"Quadequina was the brother of Massasoit"
"He was the translator for General Andrew Jackson at Ft. Jackson treaty signing"
"one of the decade's leading voices on issues of American Indian art, identity, mass culture and politics"
"Tarhe was the first chief to sign the Treaty of Greenville"
"Tisquantum was a native of the Patuxet tribe"
"Tokamahamon was another Indian from the Wampanoag tribe"
"The Chief of the Maubilians was Tuskaloosa"
"Indian-American lawyer and social activist"
"He was one of the delegation led by Keokuk to Washington in 1837"
"An Arapaho Chief of good name and a peaceable man..."
William Weatherford & his wives - "Leader of the Creeks"
General Thomas S. Woodward - "...a brave, rough, warm-hearted man, of fine intellectual endowments, a most sagacious judge of character, extensive knowledge of Creek Indian history, manners and character"
Yoholo-Micco - "The Chief accompanied the Creek delegation to Washington in the winter of 1825-26"